Was wondering if there are any common practices in backup up a firebase DB. My concern is some process accidentally wiping out our Database. As of the time of this question, Firebase backs up all instances daily. So while keeping your own backups may still be useful, it's not essential. Note that for multiple gigabytes of data, this will slow things down and lock read access for a short period. It would be better in this case to chunk the backups and work with smaller portions. The shallow parameter can help here by providing a list of keys for any given path in Firebase, without having to fetch the data first. As previously mentioned, there are also several GitHub libs available for this, and incremental backups are practical with some creativity and a worker thread on the real-time SDK. 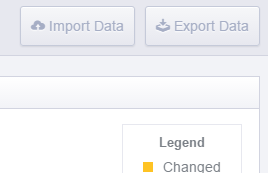 There are now "Import Data" and "Export Data" buttons on the data page of the web interface for every project, so you can now backup your data with a button click! # $1 is the Firebase projectId. # $2 is the destination directory. ...goto Firebase Console -> Realtime Database -> and click tab Backups. Just to expand @kato's answer using curl. 1) created a compute engine (basically a VM) in Google Cloud. You might be familiar with EC2 if you are from AWS world. I am sure there might be a simpler way to do this within the free tier itself. Like using cloud functions. Not the answer you're looking for? Browse other questions tagged firebase or ask your own question. How to migrate data & settings from one firebase to another? What is the proper way to store non-user data in Firebase? Firebase - WebSocket is closed before the connection is established. Will changing Firebase validation rules affect existing data? Where are Firebase 'daily private backups' stored? which database is suitable for Firebase backups? How to configure Firebase usage alerts? Is there firebase realtime database server logs exists?